When David Cameron appeared on BBC entertainment programme “The One Show” nobody expected him to get much of a grilling. However, one of the presenters had other ideas. Matt Baker, of Blue Peter and Strictly Come Dancing fame, asked the question many of us wanted to. At first I, as I’m sure many people did, thought he was asking Cameron how he was able to get away from it all and relax. But, as the dust settled, it was clear that was not the case. The gasp from his co-presenter Alex Jones really gave it away. Baker had gone off script at the very last minute and stung Cameron with the improvised question. The Prime Minister, probably surprised by the Paxman-esque hammer blow, stumbled through to the end. In one of the strangest television moments I have ever seen, the cuddly primetime show had bared its teeth. Cue lots of surprised commentators and a Youtube explosion as the video went viral. I for one am pleased by the moment though. It was unexpected, entertaining and democratic, all in one swift movement. Well done Matt Baker. That one question was probably worth the licence fee alone. I’ve always felt animations are one of the most effective ways of storytelling. As creative as the film industry can be, animations always seem to trump them. Many people view them as being naïve things. Made for children. But I believe more often than not they are actually much more mature and imaginative than their live action counterparts. Take for example the two below. The first, a short film created by Rani Naamani, is called Defective Robots. The premise is simple, but executed brilliantly. One robot is found to be faulty and is thrown away. Another robot steals its hand to use as its own. They both lose out in the end. A very straightforward tale, but it’s so charmingly done that it can’t help but put a smile on your face. No wasted time or words, just telling a story. The second is an animation based on live action footage of footballer Gareth Bale. The footage was taken from the match between Tottenham Hotspur and Inter Milan, in which Bale scored a fantastic hat-trick. Richard Swarbrick literally just drew on top of the live action footage to bring it to life in a different way. Why? Just because. It gives you a different view of something you have seen before, while displaying an amazing amount of skill. What’s the point of such animations? Well, what’s the point of anything? Just to inform or entertain in a unique way. There has been a lot of talk recently about why so many people continue to read “news” stories about celebrities, like Katie Price (aka Jordan) religiously. While I agree it seems strange at times, the answer is actually very simple: because we want to. We want to read about Katie Price’s relationships with cross dressing cage fighters. And Charlie Sheen “banging seven gram rocks” (direct quote). The general public, and consumers of news, love gossip and hearsay (not to be confused with the, erm, band). Newspapers discovered this a long time ago, and flogged this dead horse for all it’s worth. 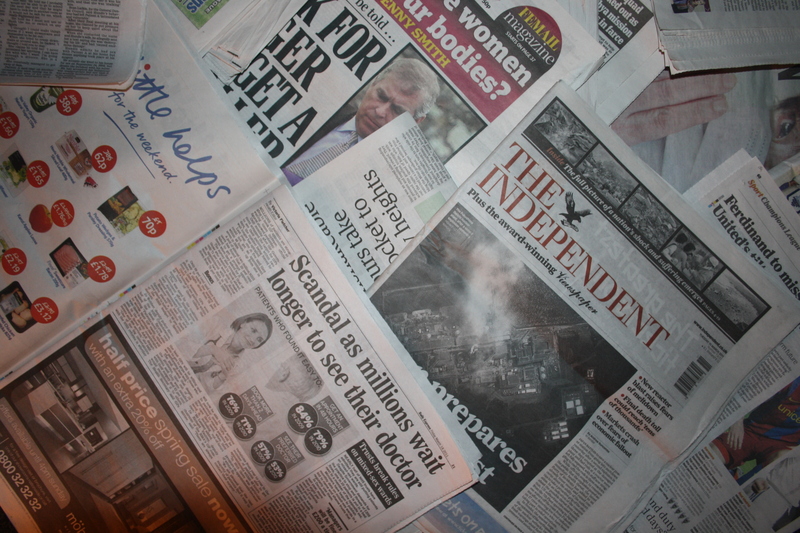 While the amount of articles published daily about celebs is extreme, don’t blame the media. Journalists found out just how much readers loved rumours and scandal. This provided an almost magic formula for editors. While nothing is guaranteed in news (which is why they’re now seemingly dying a death, but more on that later) this is as close to a cash cow as it gets. This is because of several key factors. Firstly, it’s cheap to produce. Think about it. When revenues are squeezed, you don’t want to pay for expensive investigatory journalism. You want something quick and easy to produce. Which celeb news is. You don’t need many sources, many substantiated facts or a lot of copy. All you need is “a close friend” (whatever that really means) and a nice, big pic. Simple. Secondly, there’s a lot of it. There are more channels than ever. More mags. More bands. Which means more celebs. So, there’s a constant stream of scandal, arguments and famous people collapsing out of nightclubs. It’s an all you can eat buffet. Thirdly, it’s easy to read. Whoever you are, you know you’ve read celeb news at some point. From hairdressers to Oxford academics, we’ve all done it. Sad I know. But it’s easy to consume, because it’s shiny, glossy, simply written and appeals to our bitchy side. Which we all have. The formula is simple, and makes sense. So you see an article about Charlie Sheen’s meltdown or Katie Price’s new book, feel free to read it. Or ignore it. Just don’t complain. Rupert Murdoch’s empire: Fair or undemocratic?